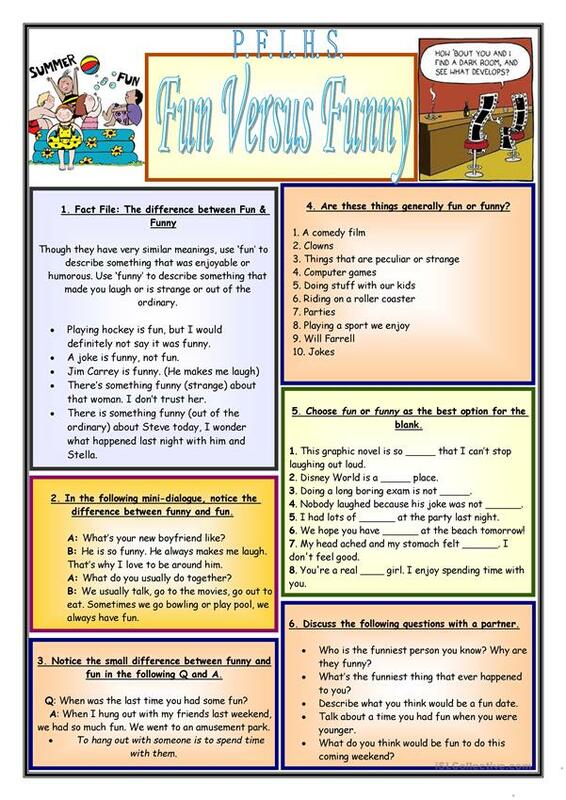 Comprehensive worksheet to help students work out the difference between fun and funny. Njoi. The present printable, downloadable handout is intended for high school students, elementary school students and adults at Pre-intermediate (A2), Intermediate (B1), Upper-intermediate (B2), Advanced (C1) and Proficient (C2) level. It is great for revising Adjectives in English, and is a valuable material for honing your students' Listening, Speaking and Reading skills. It features the theme of Describing people. billy21 is from/lives in Canada and has been a member of iSLCollective since 2012-07-12 02:12:50. billy21 last logged in on 2019-04-17 01:08:18, and has shared 30 resources on iSLCollective so far.